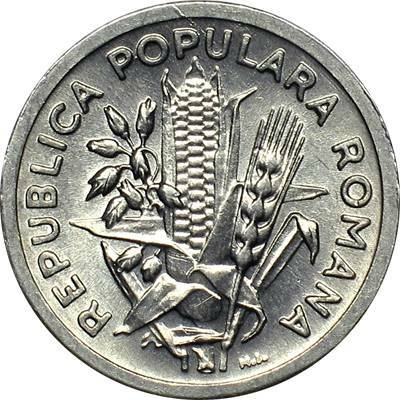 The inscription "REPUBLICA POPULARA ROMANA" meaning "ROMANIAN PEOPLE'S REPUBLIC", oat ear, corncob and wheat ear. Along the rim in the lower part of the coin, somehow right, is placed H.I. standing for Haralamb Ionescu, the engraver's name. After the monetary reform of January 28th 1952 the coins of 1 ban, 3, 5, 10 and 25 bani (presented on the following pages of the site) were introduced into circulation. 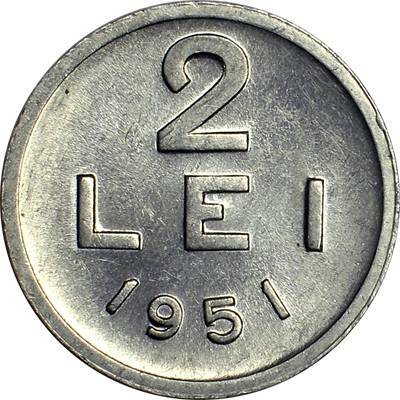 The old coins were withdrawn from circulation, the aluminum 1 leu and 2 lei from 1952 included, the later having thus circulated for a very short time. 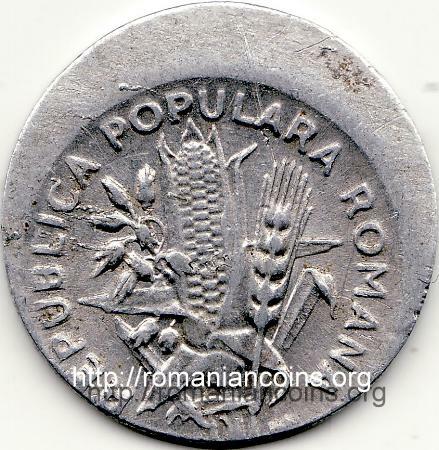 Probably, very few aluminum coins of 1952 were introduced into circulation the days before the monetary reform of January. The mintages of these coins are not known. It is certain that 2 lei 1952 is a key date, one of the rarest and hardest to find coins issued during the communist era, the rarest maybe. 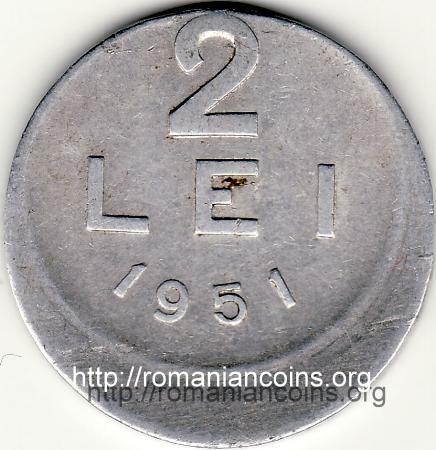 The pictures 2 lei 1951 coin above are present on Romanian coins through the kind permission of an anonymous donor. 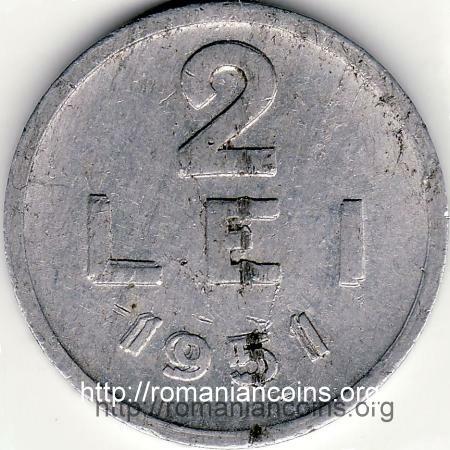 The pictures of 2 lei 1952 coin above are present on Romanian coins through the kind permission of Mr. Radu Lissner. 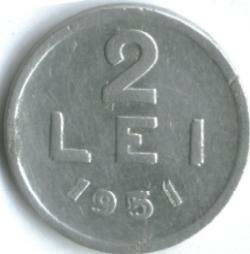 Below you can see a double strike of the 2 lei of 1951 coin and a detail of the most apparent region on it. Below you can see atriple strike of the 2 lei of 1951 coin and a detail of the most apparent region on it and an off-center struck coin. 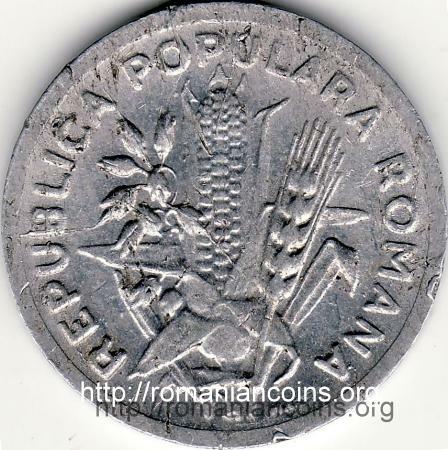 The pictures are present on Romanian coins through the kind contribution of Mr. Adrian Popovici.